It’s well known that every Italian region has its own culinary traditions, and it’s no exception when it comes to Christmas sweets. We picked one dolce di Natale for each region (some regions have more than one). What’s your favorite? Aosta Valley: Mecoulin. Hailing from the Cogne valley, Mecoulin is similar to panettone and to pandolce from Liguria; it’s a ‘milk bread’ with raisins. His recipe dates back to the Middle Ages, when it was baked in common ovens, making it an occasion for the community to be together while waiting for Christmas. Trentino-Alto Adige: Zelten. Originating in South Tyrol in the 18th century, Zelten is a spicy sweet bread with dried fruits that has variations depending on the valley where it’s made. The German name ‘zelten’ means ‘sometimes’, to indicate that it was only made a certain time of the year, in this case Christmas. Piedmont: Tronchetto di Natale. 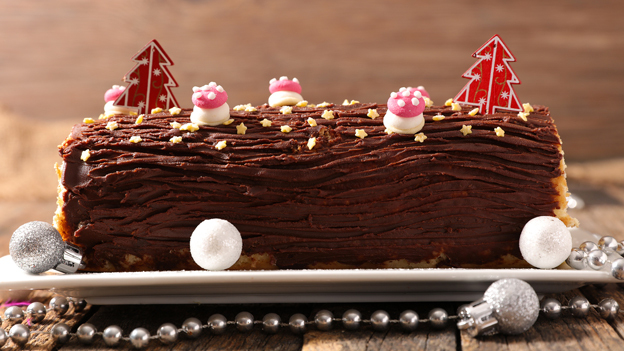 Inspired by the chestnut or oak tree trunk that was blessed and then burned on Christmas Eve, it is a calorie-rich roll made with eggs, flour and mascarpone, topped with chestnut cream and chocolate flakes. Friuli Venezia Giulia: Gubana. A leavened spiral-shaped sweet dough filled with dried fruits, raisins and amaretto, and dipped in grappa; it originated in the 1400s and the recipe has remained unchanged since. Veneto: Pandoro. Along with panettone, Pandoro is the most popular Christmas sweet in Italy. It derives from the ‘pan de oro’ created in Verona in the 19th century to celebrate the first Christmas under the Scala dynasty, and was first patented with the name Pandoro in 1894 by Domenico Melegatti, founder of the company by the same name. Lombardy: Panettone. 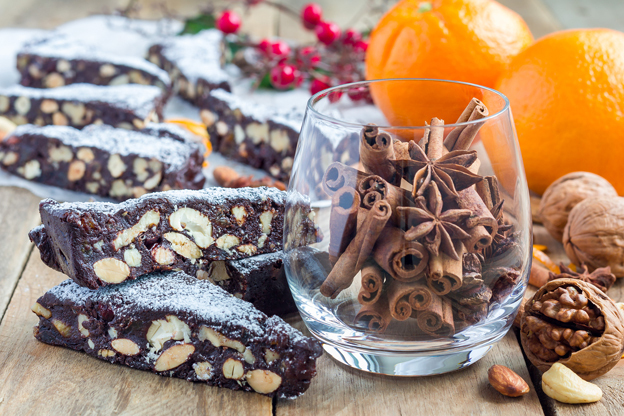 The most famous Italian Christmas sweet, now exported beyond the boot, originated in Milan in the 9th century; the dough is made with flour, eggs, butter, raisins and candied fruit. Today, there are several versions of it, which may feature chocolate, be orange-flavored, or filled with pistachio cream. Liguria: Pandolce. Hailing from Genoa, where it originated in the Middle Ages, it’s a sweet bread with raisins, candied fruit, including pumpkin, pine nuts, and pistachios. Emilia-Romagna: Panspeziale or Certosino. It’s a typical sweet from Bologna, made with almonds, pine nuts, dark chocolate, candied fruits; it originated in the Middle Ages, when it was made by the pharmacists of the time, known as speziali, and later called certosini. Tuscany: Panforte. The original recipe dates back to the year 1000, when it was prepared by the ‘speziali’ for the noble class, the wealthy and the clergy, because it contained ingredients that were expensive at the time, such as orange, cedar, melon, almonds and spices. It hails, proudly, from Siena. Marche: Bostrengo. Similar to Tuscan panforte, it contains dried and candied fruit, and cereals like farro, barley and rice. Originally, it was a ‘piatto povero’ (poor dish) of the Christmas period because it was made with leftovers. Umbria: Panpepato. Sweet and sour at the same time, almost spicy, panpepato is bread stuffed with almonds, hazelnuts, pine nuts, pepper, cinnamon, nutmeg, orange, cedar, raisins, cocoa, coffee, liqueur, grape must. Abruzzo: Parrozzo. The ‘pane rozzo’ (rough bread) was prepared for the first time in 1920 by pastry chef Luigi D'Amico from Pescara, inspired by the corn loaves of the peasant tradition; the chef added eggs, almond flour and chocolate. The first person to taste it was apparently poet Gabriele d'Annunzio, who even wrote a poem about it, ‘La canzone del Parrozzo’ (The Parrozzo Song). Molise: Caragnoli. Caragnoli are helix-shaped pancakes prepared with eggs, flour and oil and then dipped in honey; they originated in the 1500s. Lazio: Pangiallo. From Imperial Rome to today, this dessert was prepared on the day of the winter solstice as a good omen for the return of long, mild, sunny days. It includes dried and candied fruits and raisins. The yellow color (giallo) is given by the mixture of flour, oil and saffron with which the loaf is brushed before baking it. Campania: Struffoli. 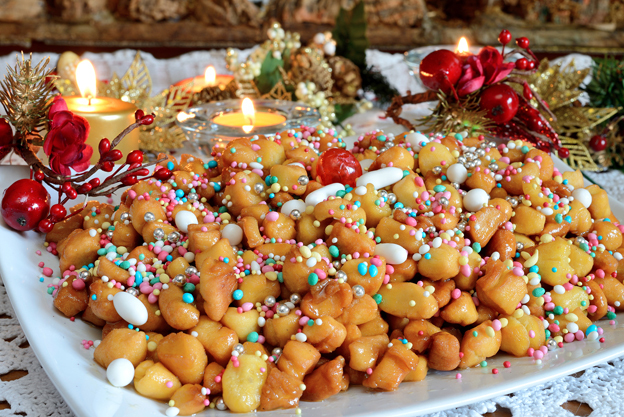 Originally from Naples, struffoli are small dough balls made with flour, sugar, eggs and lard, baked or fried, served with pieces of candied fruit, honey and pieces of sugar. Its origins go back to Magna Grecia, when there was a similar version called loukumades. Puglia: Cartellate. Also found in neighboring Calabria and Basilicata, these phyllo doughs of flour, eggs and sugar, served with the addition of vincotto or honey, date back to the 6th century BC. With Christianity, they took on religious significance, as it was said that their shape represented the strips that wrapped Jesus child. Basilicata: Calzoncelli. Fried ravioli filled with chickpeas cream, chocolate or boiled chestnuts, usually covered with homemade red wine or Aglianico wine. They originated around Potenza and spread throughout the region in the 16th century. Calabria: Nepitelle. Typical of the provinces of Catanzaro and Crotone, these half-moon shaped sweets are filled with walnuts, dried figs, almonds, Strefa liqueur, cocoa and dark chocolate, or honey, depending on the area where they’re made. The name comes from the Latin nepitedum, which indicates eyelids because nepitelle resemble a closed eye. Sicily: Buccellati. Originating in Palermo, buccellati are stuffed with dried figs, raisins, almonds, orange peel, pistachios, vanilla, and other ingredients that vary depending on the areas where they’re prepared. Also called cucciddati, they’re considered the evolution of the panificatus, a typical dessert prepared by the Romans. Sardinia: Sebadas. While they can be found year-round, these fried sweets filled with the local pecorino and covered with the exquisite corbezzolo honey, are typical of Christmas for Sardinians. They originated in the 16th century. For more Christmas stories, click here.